I've modified this from a post that I made on a DNA forum, in response to people discussing out-dated origin stories, in response to a thread looking at ancestral composition for the English. There is so much misinformation out there, and few people actually try to look at the latest evidences. It starts by looking at the key points of a recent Irish study. Ancient DNA from earlier Neolithic farmers suggests an origin from the Near East. Later DNA from Bronze Age suggests a new population had arrived and dominated, with origins from the Eurasian Steppes, including the present day predominance of Y haplogroup R1b, lactose tolerance, and blue eyes. This displacement event appears to have occurred throughout much of Western Europe. The founder population on the Steppes has been linked to the archaeological population known as the Yamna or Yamnaya. The Yamnaya were a population that existed across the Pontic and Caspian Steppes from what is now Ukraine, to Kazakhistan. They themselves were an admixed population, with ancestry from various different groups of Eurasian hunter-gatherers, and from the ANE (Ancient North Eurasian). They carried a number of successful adaptations, including the use of the wheel, improved selective breeding of horses for both riding and haulage, lactose tolerance, use of horse drawn wheeled carts, and a very successful pastoral based economy revolving around the herding of a number of species of livestock. They are strongly figured to have carried an Indo-European language into Europe and elsewhere (South and Western Asia). That Indo-European language being the ancestor of the vast majority of modern European languages today. They may have also carried many of the most common haplogroups of modern Europeans, including Y hg R1a, R1b, and some mt hg H types among others. There is a hypothesis that the earlier peoples of Europe, the Early Neolithic farmers, who had largely descended from early farmers in the Levant / Anatolia, had been suppressed by a number of possible environmental and climatic events. This might have paved the way for such a successful displacement of European populations. As the descendants of the Yamna swept westwards into Europe during the Copper Age, so they spawned a series of new archaeological cultures including the Corded Ware of Eastern and Central Europe, and the Bell Beaker culture of Western Europe. The Bell Beaker culture spread from Central Europe to the Western Atlantic Seaboard, and from Portugal up to Scotland. Classic artifacts include archer burials in round barrows, the bell beaker ware pottery, round scrapers, and barbed and tanged arrowheads. It was the dominant culture of Early Bronze Age Europe. One suggestion is that it spawned the later Iron Age Celtic cultures, including the classic Western Atlantic Seaboard Celtic Culture. This culture may have simply evolved locally and through trade links along that seaboard. The Irish study above supports the Yamnaya hypothesis. It supports displacement during the Early Bronze Age, and that the present day, fairly homogeneous population of Ireland, largely descends from Copper Age Eurasian Steppe pastoralists. Okay, so what if we apply that also to the late prehistoric British populations? Scottish and West British today appear to have a close genetic distance to the Irish. How about the lowland SE British? It might be the case, that they had fresh admixture, exchanged with the Continent, and particularly with the expanding Germanic cultures. These events could have occurred even during late prehistory. This genetic study looked at the British Isles including Northern Ireland, but excluding the Republic of Ireland. It tested a large sample group of present day British with known local ancestry. 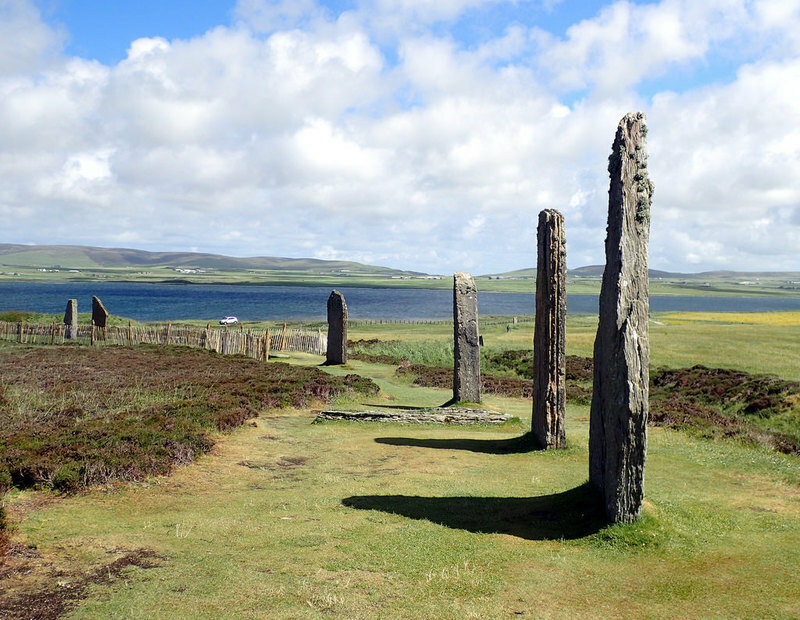 Orkney had the most distinctive population, with a known high percentage of Norse ancestry. The Welsh were distinct from the English. However, they were the most diverse group, with a clear division between the North Welsh and South Welsh. Cornwall was also distinctive from English. Northern Ireland clusters with Scottish. There was no homogeneous shared British “Celtic” population. The Scottish, North Welsh, South Welsh, and Cornish being quite distinct from each other. The South-East British (most of the English) were surprisingly homogeneous, although the boundaries of the old Anglo-Saxon kingdoms could still be distinguished. The Continental Anglo-Saxon contributiion to present day English people appeared to be circa 10% to 40%. This contradicts Bede's claims of a genocide. The English descend more from earlier British populations than they do from Anglo-Saxon immigrants. Although the Norwegian Viking contribution to Orkney was distinctive, the Danish contribution to Eastern England could not be detected. This may be because of the close genetic distance between Danish Viking and some earlier Anglo Saxon settlers makes it impossible to see. Although there was no “Celtic Fringe”, the Welsh appear to be closest to the late prehistoric British population. Any Iberian contribution appears to be tiny and insignificant. There appeared to be a contribution in Southern Britain, particularly in Cornwall, from a population shared today by the North French. This contribution appears to have occurred during late prehistory and is historically unknown. Okay, so that is suggesting a diversity across the British Isles that extends into Prehistory. A key finding to this thread is that it found the English to be an admixed population, with earlier British ancestry dominating Anglo Saxon ancestry from the Continent. Iron Age and Anglo Saxon Genomes from Eastern England. Schiffels, Haak, etal. 2015. This qualitative study focused on ancient DNA from a number of Iron Age and Anglo Saxon cemeteries in the Cambridge area of SE England, referenced against modern populations. The closest genetic distances on the Continent between the Anglo Saxon settlers and present day Europeans was to the Dutch and Danish. They found evidence of admixture and intermarrying. Individuals with both Iron Age British, and Anglo Saxon ancestry. People of Iron Age British ancestry were adopting and embracing Anglo-Saxon culture and grave goods. The richest graves were of local Iron Age British ancestry (with Anglo Saxon cultural artifacts). The poorest graves were recent Anglo-Saxon arrivals. We have to be careful about who we regard as the Celts. A Celtic culture did exist, but it wasn’t necessarily brought to the British Isles and Ireland by an Iron Age people. It may have developed on the Western Atlantic Seaboard from earlier Bronze Age peoples. Those Bronze Age peoples, predominantly descended, from Eurasian Steppe Pastoralists, that had swept across Europe, bringing innovations. They are the oldest peoples of Ireland and the British Isles, but they did not form a homogeneous Celtic Fringe. There must be more to it. The Anglo-Saxon event in SE Britain was a major and significant migration. However, it was not the genocide of Bede's claims. Hengist and Horsa were clearly mythological origin characters akin to Romulus and Remus. The modern day English are an admixed population. They have a foot both in earlier British ancestry, and in Anglo-Saxon / North Sea migration.